KME CNC is offering a revolutionary way to utilize five axis positioning, on virtually any machine. All that is required is one M-Code, no matter how many indexers are involved. The harmonic drive technology used allows a ± 5 Arc secs repeatability as well as a guaranteed zero backlash for 10,000 hours. 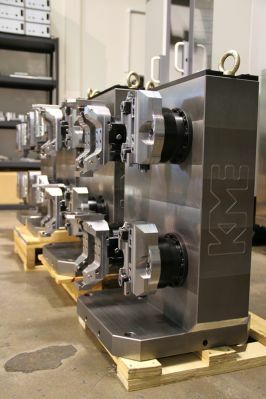 KME CNC prides itself in designing and manufacturing American-made 5 axis systems. They specialize in turning 3-Axis Vertical Machining Centers or 4-Axis Horizontal Machining Centers into 5-Axis production machines. By integrating those systems, they help companies save machining time as well as costs. In some cases, some companies have been able to double their overall production by cutting their machining times by more than half. KME CNC's standard 5-axis Tombstone for Horizontal Machining Centers comes with four platters or can be customized, based on customer needs, to include up to eight platters or even 12. This innovative product lets customers machine multiple 5-axis work in a single set up. It allows the customer to operate each 5-axis platters independently or simultaneously. With one set up, customers will never have to remove their work piece. For instance, a custom tombstone with 8 platters will have its platters working simultaneously or independently, giving it the ability to share tools with 8 different parts, thus minimizing tool changes in addition to producing high tolerance parts and saving tremendous amount of time. KME CNC's Trunnion for Vertical Machining Centers has the lowest platter height in the industry, with 8.38" from table to platter, allowing maximum Z height clearance. KME CNC enables the customer to integrate 1, 2 or 3 platters on the C axis, based on their specifications, giving their VMC full-range production capability.